(CNN) -- Investigators have found the vehicle of a University of Georgia professor wanted in the killing of three people. 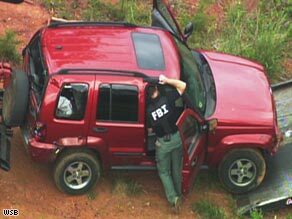 Authorities examine a Jeep belonging to professor George Zinkhan on Friday in Clarke County, Georgia. Police found George Zinkhan's vehicle early Friday in northwestern Clarke County, home to the University of Georgia, the university said in a statement. Authorities have been looking for a 2005 red Jeep Liberty that Zinkhan was driving when he was last seen six days ago after a shooting left three people dead, including his wife. Last Saturday's shootings happened at a community theater group's reunion in Athens, Georgia, just off campus. The university fired Zinkhan from his job as a marketing professor the day after the shootings. Zinkhan had purchased a plane ticket to the Netherlands for travel on Saturday, said Gregory Jones, special agent in charge of the FBI's Atlanta, Georgia, office, this week. Authorities have said Zinkhan owns a home in Amsterdam, Netherlands. Police Capt. Clarence Holeman identified the dead as Marie Bruce, 47, Zinkhan's wife and an Athens attorney; Tom Tanner, 40; and Ben Teague, 63. Holeman said it appeared that Zinkhan "and his wife were having problems." Police said Zinkhan has relatives in Texas as well as in the Netherlands. University Police Chief Jimmy Williams said Monday that authorities do not believe Zinkhan remains on campus or in Athens. However, he said, security has been beefed up on campus, including officers on foot patrols carrying semiautomatic weapons. The victims were all associated with the Town and Gown Players, a theater group that was holding a reunion picnic at the time of the shootings. "The three people we lost were a part of the rich 50-year history of this theater and, more than that, were vital members of the Town and Gown family," the organization said on its Web site. The site described Bruce as "the binding force that held the Town and Gown community together." "Having worked with Town and Gown for over 20 years, at one time or another she served in every capacity at the theater, artistically and administratively, from leading lady to president of the board to chief cook and bottle washer." Police said Zinkhan arrived while the Town and Gown event was under way. According to Holeman of the Athens police, Zinkhan got into "a disagreement" with his wife. He left the scene -- police believe he went to his car, where the couple's children apparently were waiting -- and returned with two handguns. The shootings "only took a few minutes," Holeman said. Police found eight shell casings, he said. After the shootings, Zinkhan left the scene with his children -- ages 8 and 10 -- still in the vehicle, police said. He drove to a neighbor's house in nearby Bogart, Georgia, where he lived, and left the children there. The neighbor, Bob Covington, said that Zinkhan arrived at his home shortly after noon Saturday with the two children. "He rang the doorbell -- asked me if I could keep his kids for about an hour," Covington said. "I said sure, and he said there'd been some type of emergency, and he took off." An hour or so later, Covington said, police arrived and took the children.